and proceeded to try to reach into my bag to retrieve it. i wondered if that had really just happened. “i’ve said this before, and i say it again. 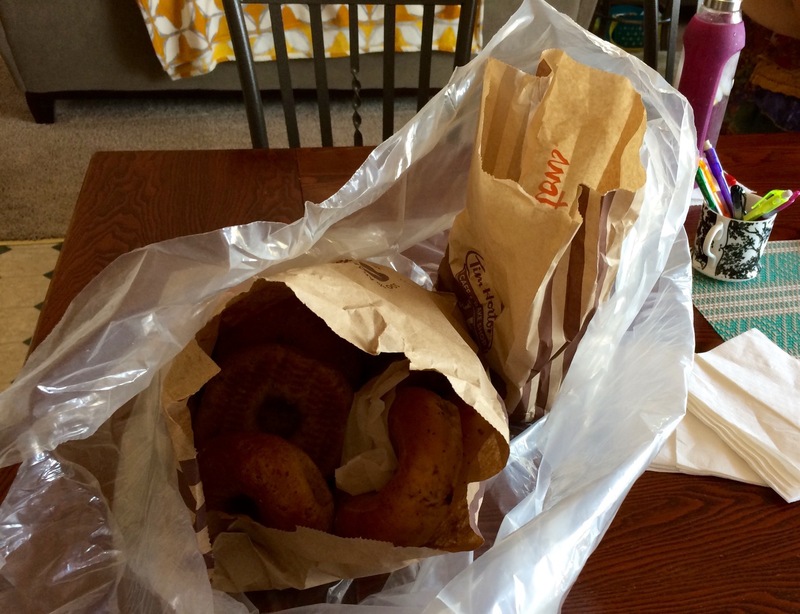 bagels can be an enormous power for good or for evil. My eyes are bulging right about now. This happened at Rimmys? Good grief. What are some people like! What a great novel title: “Bagels: A Force for Good or Evil?” I had to laugh Beth – too funny. Timmy’s are usually better than that but they are franchises and sometimes there are a**hole owners who don’t train properly. I love Timmy’s in general, and have occasionally seen franchisees overstep. There was a case in Canada a few years ago where a customer with a few small children entered one of their stores. it was winter and the kids were all bundled up. While the Mom was ordering a little one started to fuss so a passing employee gave the child a free Timbit (with the Mom’s permission). The next day the owner was reviewing security tapes and saw the gift (less than a cent in cost). The owner fired the employee for theft. The employee went to the press and the wires picked it up and the story went coast to coast. To say that HO was upset at the owner was an understatement. They took away his franchise, apologize, rehired, and promoted the employee (with a raise). Ah Tim’s…… I guess the positive spin on this is that the drive thru worker was advocating for her customer….. Okay. No. No. We can’t let chaos reign. But it was a Tim’s bagel. Good thing you were in control. so funny, and i totally get that ! Wow! And I thought bagels were always a force for good. Serious Baglery. Plain or Death? Bagel, lox, cream cheese, lettuce and tomato(no onion) knish(dab of mustard) and hot coffee(no sugar or cream) now please. A friend of mine was in a McDonald’s in midtown New York and a homeless guy came to his table, said “yeah, you’re through,” and took his tray. I don’t know why I thought of that when I read your story, but it’s the same kind of reaction he had… only he didn’t get the rest of his lunch back. What on earth has happened to common courtesy these days? Although when one needs one’s bagel… well, ahem. Powerful force indeed. Too funny. Thinks … I would be tempted to negotiate …. Does that make me a bad bagel person? Wow. I’m sure that worker felt really foolish. Too caught up in the desire to fulfill his customer’s orders. And what an amazing and perfect quote you found to accompany this story! Hmm. At least he backed off your bagel! Unbelievable – except it happened to you. Bagel bandit!